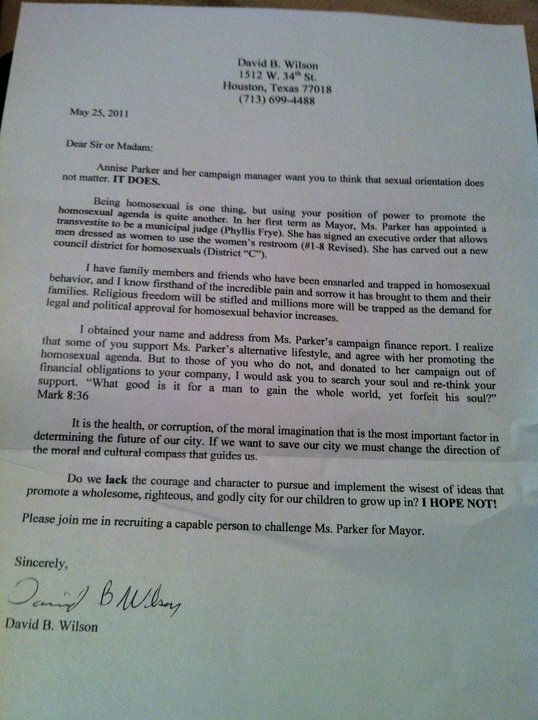 It was only a matter of time really: Dave Wilson is sending anti-gay letters to Houstonians attacking Annise Parker. Wilson, you may remember, is the homophobic electrician who sent 35,000 flyers to Houston homes during the 2009 elections with a picture of Parker's swearing in for her previous position as City Comptroller, her partner Kathy Hubbard at her side. The 2009 flyer asked the question "Is this the image Houston wants to portray?" To which Houston voters resoundingly replied "YES!" Annise Parker and her campaign manager want you to think that sexual orientation does not matter. IT DOES. Being homosexual is one thing, but using your position of power to promote the homosexual agenda is quite another. In her first term as Mayor, Ms. Parker has appointed a transvestite to be a municipal judge (Phyllis Frye). She has signed an executive order that allows men dressed as women to use the women’s restroom (#1-8 Revised). She has carved out a new council district for homosexuals (District “C”). I have family members and friends who have been ensnarled and trapped in homosexual behavior, and I know firsthand of the incredible pain and sorrow it has brought to them and their families. Religious freedom will be stifled and millions more will be trapped as the demand for legal and political approval for homosexual behavior increases. I realize that some of you support Ms. Parker’s alternative lifestyle and agree with her promoting the homosexual agenda. But to those of you who do not, I would ask you to help me stop the promoting of the homosexual lifestyle in Houston. 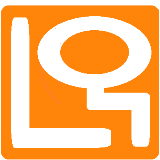 It is the health, or corruption, of the moral imagination that is the most important factor in determining the future of our city. If we want to save our city we must change the direction of the moral and cultural compass that guides us. Do we lack the courage and character to pursue and implement the wisest of ideas that promote a wholesome, righteous, and godly city for our children to grow up in? I HOPE NOT! Please join me in recruiting a capable person to challenge Ms. Parker for Mayor. Is commentary even needed? Beyond the gross inaccuracy of calling the Hon. Phyllis Frye a "transvestite," (Frye identifies as transgender and is legally recognized by the State of Texas as female) Wilson completely misrepresents Parker's executive order insuring that women may use the women's room and men may use the men's room regardless of what gender other people might assign them. It may be easy to dismiss the letter as the ravings of a bigoted crank, but Wilson puts his money where his mouth is (he was a major donor to Parker's 2009 runoff opponent Gene Locke), and he has the influence to pull other donors with him. According to Noel Freeman over at Boots on the Bayou four candidates have officially entered the Mayor's race: Parker, Bryan Carr (who, as a non-Houston resident is ineligible), Fernando Herrera (who ran an unsuccessful Republican campaign in 2010 to unseat Jessica Farrar in the Texas House) and Kevin Simms. Expect Wilson to pick his favorite challenger in the next couple of months and start funneling money that way. Once that happens the question will be if Wilson's favorite will keep the money (as Locke did in 2009), or refuse it. Day 123: "Don't Say Gay"